UPDATED 27Jul2018: Summer is the season you’re most likely to refinish outdoor trim, door frames, window sashes and finicky woodwork of all kinds, and detail sanders are tools I’ve come to rely on for this kind of work. Also called multitools these days because they can also cut and grind with different attachments, detail sanders are not for stripping back large expanses of bare wood. A 6″ random orbit sander is my tool of choice for that, but not all stripping is about bulk removal of old finishes. When it comes to those small nooks and crannies that are part of most refinishing jobs, detail sanders are king. They’re so much better than fooling around by hand with little pieces of folded sandpaper in tight quarters. Current designs have been refined to the point where they deliver pro-grade results very quickly. That said, there still are tricks you need to apply to get the best possible results. Regardless of the detail sander you choose, sandpaper is an issue. All power tool companies that make these machines also offer little high-priced triangular pieces of Velcro-backed sandpaper in brand name packages. Trouble is, these are expensive and not always readily available. My solution is to buy a roll of Velcro backed sandpaper (80- and 120-grit are all I ever need), then cut the triangles to fit the sanding head. 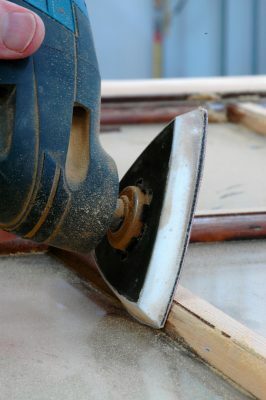 Simply unroll three or four inches of sandpaper, place the tool’s Velcro-backed sanding head on top, then trim around the triangular pad with scissors. You’ll not only save money, but you’ll get better abrasives, too. The abrasive surface on all detail sanders is small, so these triangles clog up quickly, especially when sanding off old paint or varnish. You’ll constantly be putting new paper on, so economy and quality matters. Where I live in Canada, I buy rolls of Velcro-backed sandpaper like the stuff you see here at Stockroom Supply (877-287-5017). Here are some tips I’ve learned the hard way: If you’re sanding wooden window frames, be careful not to scratch the glass with the edge of the triangular detail sanding pad. Abrasives mark window glass easily and permanently, as I know from my own mistakes. Another issue is how smooth you sand exterior wood surfaces destined to be finished with paint or varnish. You’ll create the most durable finishes on exterior wood if you don’t sand with anything finer than an 80-grit abrasive. This might seem too rough, but it’s best for exterior surfaces. Tests prove that this level of smoothness maximizes the absorption of finishing liquids. 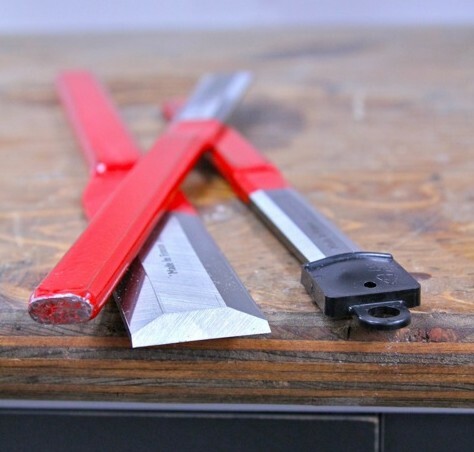 Also, you’ll find rounding over sharp edges and corners slightly helps the new finish last longer. This is where a piece of hand-held sandpaper makes the most sense. 120-grit is ideal for this little job. Sharp corners are often the places where coatings spread out more thinly during application, and this thin film layer fails soonest while causing neighbouring areas to peel prematurely. Tear a standard piece of sandpaper in quarters, fold each piece in thirds, then get to work. Back in the early 2000s, Bosch came out with the first 12-volt cordless detail sander. That’s it at work here in the photo. Other manufacturers have followed suit. Battery operation definitely boosts convenience, yet these tools are still powerful enough for light or medium-duty applications. These days I do most of my detail sanding with cordless models, using corded models only for tougher applications where more material needs to be removed. 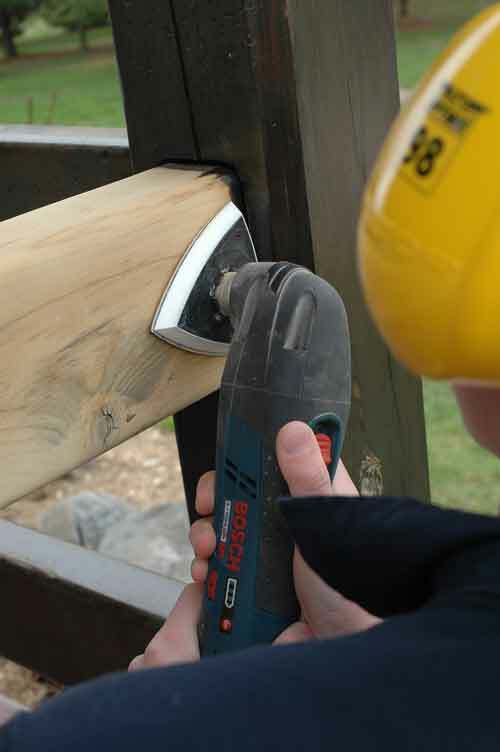 At the moment, my favourite detail sander is the 20V DEWALT DCS355D1 multitool. It’s the most powerful and effective cordless I’ve tried to date. I have more than half a dozen detail sanders in my shop left over from the tool testing I do, and the DEWALT is the one I reach for when I need to do sanding in tight quarters. Click below for a video tour of various multi-tools that I filmed back in 2009 during a test I was running for a magazine story. If you’re new to multi-tools, be sure to check out this video. It explains how the work for both sanding and cutting applications.